Welcome To Fall Creek’s New Website! We are thrilled to welcome you to our brand new website. We hope you will take a moment and dive in! Region Focus – An often used theme is “We go where you grow.” This means that we are truly global to serve your blueberry growing needs - no matter where you grow in the world. With four wholly-owned subsidiary nurseries in the U.S., Mexico, Peru and Spain and licensed partners in other key regions, we are nearby and ready to provide the varieties, plants grower support and service when you’re ready. Our site reflects this and will take you to the important information that is specific to your growing area. Access To Our Sales & Grower Support Team – We have an incredible team of the industry’s top experts in blueberry farming ready to serve you. Whether you’re just starting a project and needs lots of support or a seasoned grower with a few questions, in your region’s section, you’ll find the team members who serve your region. Rely on them to bring you the latest insights on site selection, field prep, variety insights, planting and care advice, the latest news in technology, and important market intelligence. Information-Packed Variety Catalog – Wait until you see our new variety catalog. In the main site, you will see our complete variety portfolio with all the details from berry attributes to ripening season, flavor descriptors and more. Don’t forget to click through variety photos by clicking on the little dots at the bottom of the photos! Jump to the variety catalog listings within a region and you'll find only those varieties Fall Creek offers in that part of the world. This narrows your search a little. And speaking of narrowing your variety options. . . . Variety Sort – Have a region and specific blueberry attributes in mind? You can also sort varieties by chill category, attributes and more. We have the industry's best selection of blueberry genetics and our new website will bring you comprehensive information on every variety in our extensive portfolio. However, it's important to talk to the Fall Creek representative for your growing area. They are ultimate experts in variety selection and can give you the best insights relevant to your needs and region. Blue Notes - Fall Creek's Fresh Blog – Be sure to visit our Blue Notes Blog. 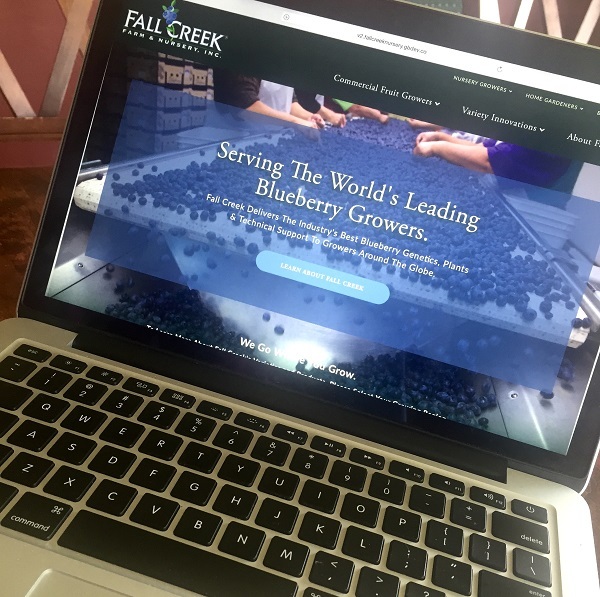 Here you'll find current blueberry industry news, tips and announcements from Fall Creek and regular variety updates mixed together with fun blueberry facts, stories about people at Fall Creek and delicious recipes. Be sure to subscribe by clicking the light blue "Subscribe" button in the upper right hand corner and have our posts delivered right to your inbox! Mobile-Friendly – You should also find that our new website is easy to read, search and navigate on all types of mobile and desktop devices. So surf away whether you're in the office or standing in your field! These are just a few features of our new website. We're pretty excited about it and hope you are too. Our goal is simple - To make sure that we always deliver all the latest and most relevant information you need when you need it and where you need it so you can make timely, informed decisions about your blueberry growing operations. We care about your success. We'd love to hear from you. Send us an email to marketing@fallcreeknursery.com or share your thoughts in the comment section below.